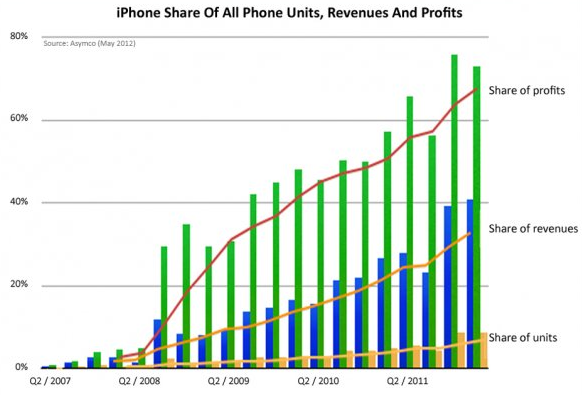 Apple has a massively larger share of total smartphone profits versus its share of smartphone units. If/when the competition is successful in creating attractive enough alternatives, price competition may become more important, with a necessary compression of the Apple profit margin. Profit margin erosion is probably a greater risk than a reduction in unit sale growth. This chart shows the disparity between units market share and profits market share. This entry was posted on Wednesday, May 2nd, 2012 at 6:01 PM and is filed under Interesting Charts. You can follow any responses to this entry through the RSS 2.0 feed. Both comments and pings are currently closed.